Please understand the significance of Prophetic happenings which are occurring at a blinding rate of speed these last days. Even as I warned months ago, that these evils of the Molech (Lucifer) worshippers against mankind would compound. It is YOUR responsibility given you by Our Lord and Savior to sound the Alarm. Why are YOU Silent? Yet Confess the Lord Jesus? Added 2-5-2017, they have found their red heifer, their Golden Calf to cleanse the sanctuary of abomination which causes desolation………………. “And: As Israel became pure through the ashes of the golden calf, which Moses burned and ground into a dust – “… and he burned it in the fire, and ground it to powder, and scattered it upon the water… “ So Israel becomes pure through the ashes of the red heifer”. And more. Do you not understand? The Vision is Begun in that bloody whore city jerusalem, spiritual Sodom and Egypt where our Lord was crucified. 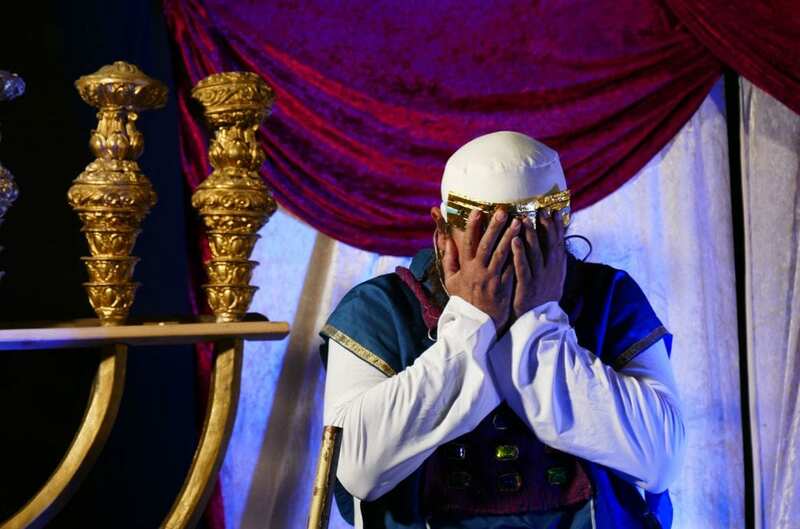 The reenactment was initiated by the Midrasha L’Ad Hamikdash, headed by Mordechai Persoff, and the nascent Sanhedrin. 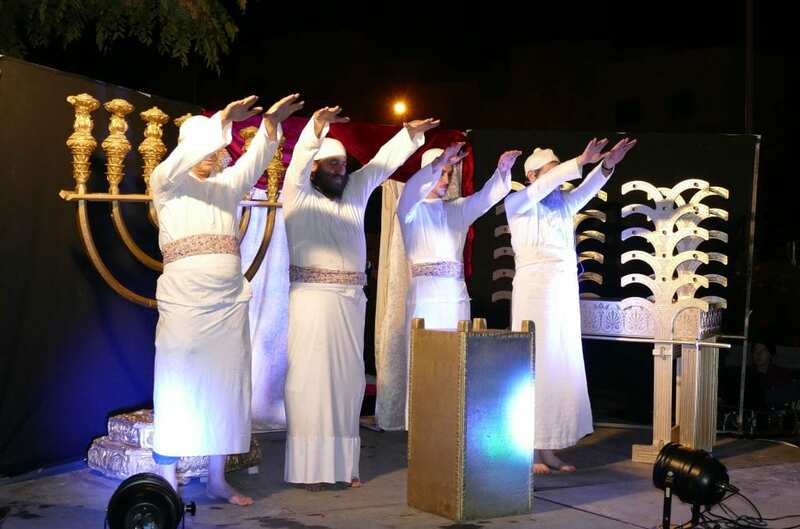 Rabbi Hillel Weiss, spokesman for the nascent Sanhedrin, explained to Breaking Israel News that the reenactment was not just for benefit of the spectators. 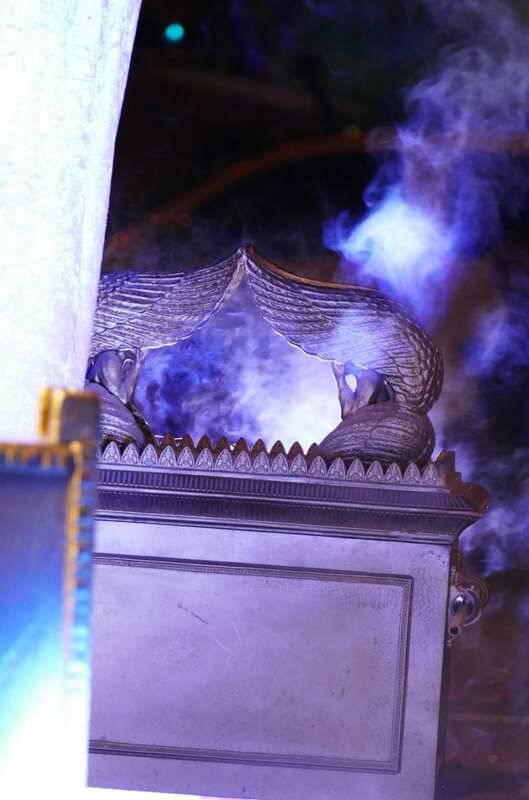 For the demonstration, the Kohanim (priests) used silver horns that are ready to be used in the Temple, and wore clothes that are specially prepared use in the Temple. The belts worn by the regular Kohanim are shatnez, a mix of wool and linen that is forbidden except when used to make clothes for the Kohanim. 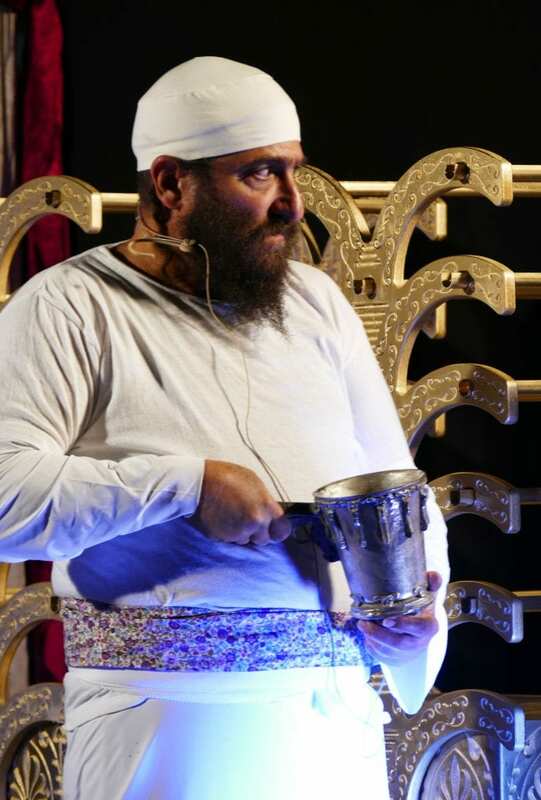 In the demonstration, the Kohen Gadol wore a representation of the Choshen Hamishpat (breastplate) and the golden headband upon which was inscribed “Kodesh La’Hashem” (Holy to God). 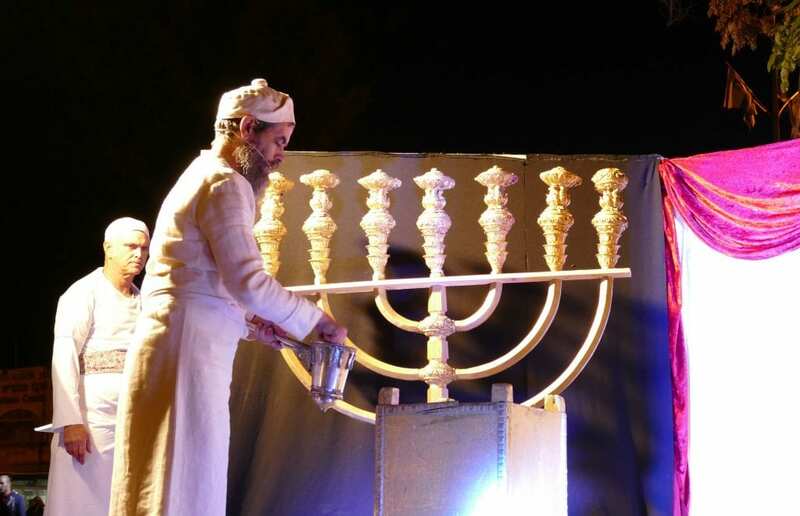 Behind the Kohanim, on the left side, is the seven-branched menorah that was lit every evening in the Temple. To the right are two models of the racks that held the show-breads. In the center is a model of the small, golden altar, upon which the incense was burned. 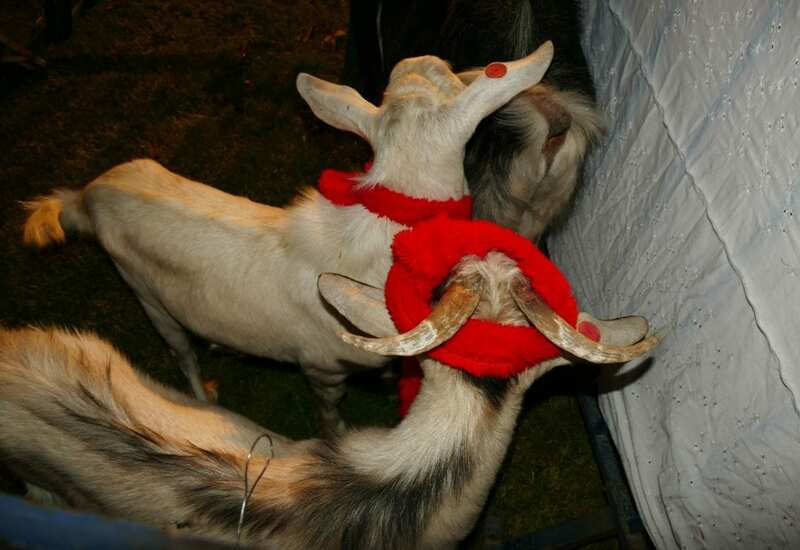 In preparation for the Yom Kippur service, two identical goats without blemishes were selected. Shani (scarlet wool) was wrapped around their horns. Lots were chosen to determine the fate of the goats. One goat was sacrificed on the altar and the other was taken to a cliff named “L’Azazel”, where he was thrown over the edge. If the sacrifice succeeded in atoning for Israel’s sins, the wool on the horns of both goats miraculously turned white. The goats are arranged on either side of the Kohen, who chooses the two lots, putting one in his right hand and the other in his left. One lot says “L’Azazel”, described in the Talmud as a “harsh place”, and the other says, “La’Hashem” (to God). He then places the lots on the forehead of the goats, indicating the fate of each goat. 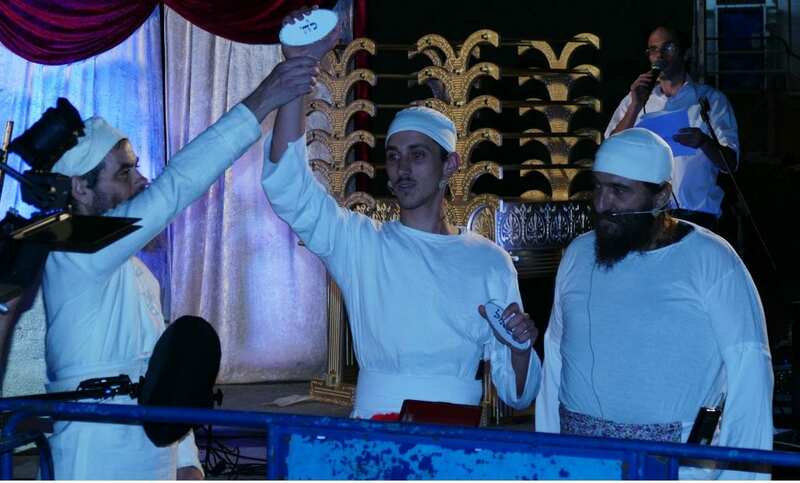 After the goat that received the lot inscribed “La’Hashem” is ritually slaughtered, the blood is caught in a special container and brought to the altar where it is sprinkled on the white stones. The container used for this must be swirled so the blood will not coagulate, hence the bottom is pointed so it cannot be rested on flat surface. The demonstration did not include slaughtering the goats, which were not suitable to be brought as a Yom Kippur sacrifice in any case. An aspect of the Temple service that is still practiced is birkat hakohanim (the priestly blessing). The kohanim did not wear shoes inside the Temple, and even today, before performing the priestly blessing in synagogue, kohanim remove their shoes. 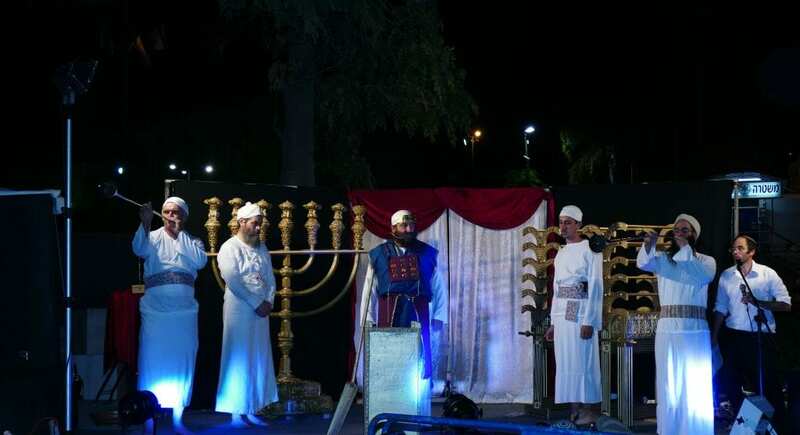 To the extreme right is Rabbi Baruch Kahane, who has played a major role in previous Temple reenactments and in an ongoing program to trainKohanim to serve in the Temple. 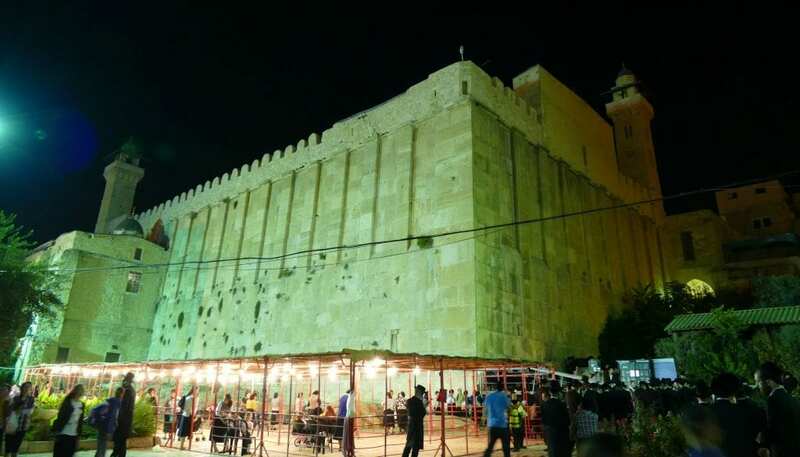 The event took place directly beneath the Cave of the Patriarchs (Ma’arat Hamachpela in Hebrew) in the holy city of Hebron, an ancient Jewish city now largely populated by Arabs. 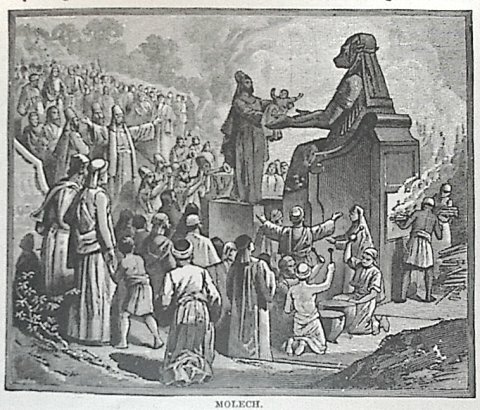 These Talmudic Satan worshippers of the earth of their flesh along with their TBN Tamudic Tinky Winky Telly Tubby Televangelist evangelicals of mammon, think that Jesus the King Lord God Almighty will sit in this third Temple of Abomination and rule this wretched flesh earth, thus they have deceived the unbelieving masses who did not Believe the TRUTH in Righteousness………………………I Advise,……. Prepare, Pray, Repent all, whether jew or greek, for the Day of the Lord’s wrath will be a Terrible Day.